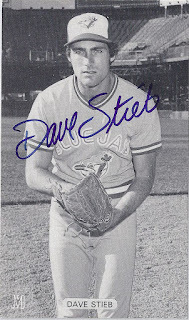 Yeah, that's right, I put the words "Dave Stieb" and "HoF" in the same title. Am I out of my mind (hint: highly probable)? After all 176 Wins, a 3.44 ERA, a shade over 1,500 K in fewer than 3,000 IP doesn't exactly scream "Cooperstown!" as a body of work does it? The surface numbers just aren't there. Ok, what about the awards? 7 All-Star selections (1980, 1981, 1983, 1984, 1985, 1988, and 1990), one 4th place Cy Young finish (1982), one 5th place Cy Young finish (1990), and back to back 7th place Cy Young finishes (1984, 1985). 7 All-Star games in 11 seasons is extremely impressive, but the rest of it doesn't add up either. In fact it's kind of meh for HoF consideration. So what the hell am I on about? What if we were to retroactively go back and use some metrics that are used today to see who should've won the Cy Young every year from 1979 through 1992 (the seasons that Stieb and the guy he is most often lumped in with - John Scott "Jack" Morris were [for the most part] average or better pitchers in the American League)? I'm not saying we go and pry the trophies from those who were awarded them. They won them fair and square. The "metrics" that were used to determine them are somewhat dated though, and perhaps a re-examination is in order. The Cy Young is looked at differently now than it was then. Back then usually the pitcher with the most pitching wins on a playoff team took home the hardware unless the writers felt a reliever was more worthy. That has changed recently, and there was no clearer evidence of this than Felix Hernandez' 2010 AL Cy Young Award for the last place in the AL Seattle Mariners (who went 61-101 on the season). Hernandez went 13-12 with an MLB leading 2.27 ERA while facing an MLB leading 1,001 batters. He led the AL in GS with 34, and IP with 249.2, while allowing a league low 7.0 hits per nine innings. He wouldn't have stood a chance back when Stieb was pitching. He might've gotten a token vote or two from the Seattle writers along with praise for a great season, but I doubt he would've garnered serious consideration in a season in which CC Sabathia won 21 games for the playoff bound (2nd place in the AL at 95-67) New York Yankees. "The King" absolutely lived up to his nickname that year. He paced the AL in bWAR (7.1), WPA (among SP [4.57], second to Joakim Soria [4.61] among all pitchers), and REW (4.19), and was third in fWAR (5.9) behind Cliff Lee (7.0) and Justin Verlander (6.3) along with his league leading traditional stats noted above. Simply dominant, and he was rewarded for it. Stieb had similarly dominant seasons and all he got from the voters was the sound of crickets. It was a different era though, and if he's ever truly going to get his due, it needs to be exhumed and examined. Don't worry my fellow Eck loathers, I'm trading this Cy Young in for the ridiculous one he received (along with the MVP!) in 1992. This one would've been a lot more deserved, trust me. He led the AL in bWAR (7.3), WPA (among starters [5.03], was second to Aurelio Lopez [6.19] among all pitchers), REW (4.43), in addition to leading the majors in ERA+ (149). Having a 2.99 ERA in the hitters' haven that is Fenway Park over a full season is a spectacular achievement, and he would've fully merited receiving this award. Mike Flanagan went 23-9 though (compared with Eck's 17-10) on a team that came within one win of a World Series title (had three cracks at it, but it was the year of Willie "Pops" Stargell and the "We Are Family" Pirates), and that was pretty much all she wrote. A couple of interesting notes about my top ten. Look at the number of quality lefties in the league back then. Six of my top ten were southpaws. Six! Guidry, John, Koosman, Flanagan, Caldwell, and Monge. Five starters and Monge. Where have all the lefties gone? Also, Jim Kern everybody. A 6.2 bWAR and a 4.7 fWAR in 71 relief appearances and no starts. What? That is insane. His other numbers included a 13-5 record with 29 saves and a 1.57 ERA over 143.0 IP. 70.0 IP is about what you see today for most relievers, 80.0 IP at the most. As for the Morris/Stieb rivalry: Morris 1, Stieb 0. The first step for any expansion team is to not lose 100 games in a season. Mission accomplished for your Toronto Blue Jays in 1980! It felt like a championship, after three straight seasons of 100 loss misery, but 67-95 was still only good enough for last place. 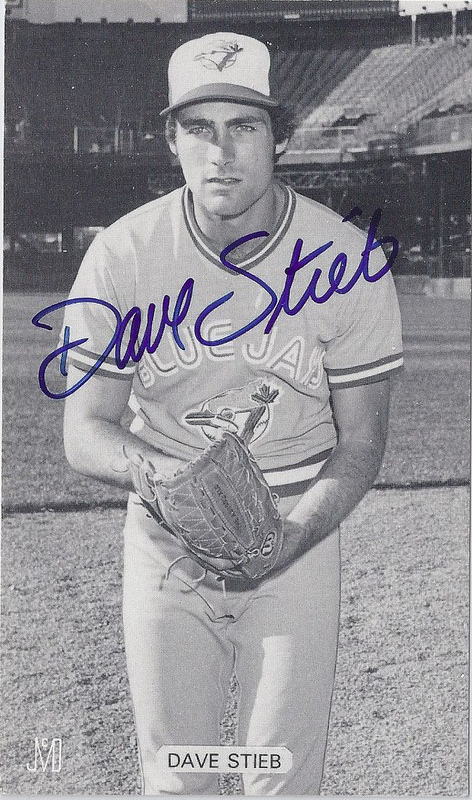 Dave Stieb and Jim Clancy established themselves as co-aces for the home nine, and Jerry Garvin had a strong season out of the bullpen. Their win/loss records and ERAs didn't show it but Stieb (12-15, 3.71) and Clancy (13-16, 3.30) were definitely top 15ish pitchers in the AL that year, and with 14 teams in the league, to call them co-aces (in the lower tier, but there nonetheless) isn't really a stretch. Stieb was 7th in bWAR (4.9), and 7th in fWAR (4.3), while Clancy was 5th in bWAR (5.5), and 22nd in fWAR (3.2). Both had a solid ERA+ (Stieb: 117, Clancy: 131), which I think tells more of a story than their raw ERAs because pitching in the "Mistake by the Lake" for half your games every year had to be a huge challenge for any pitcher. Both were also under 25, (Stieb 22, Clancy 24) which also boded well for the future. Oops! There's one name in the BBWAA list that didn't make it onto mine, and that would be the guy that was given the award that year: Steve Stone. He did win twenty-five games on a team that won one hundred, and he had a respectable 3.23 ERA (123 ERA+), but I pegged him somewhere around 15th just behind Stieb and Clancy. A solid showing, but IMHO not worthy of the hardware. Mike Norris was robbed blind that year. He led the AL in fWAR (6.0), WPA (among starters [6.22], third among all pitchers behind Corbett [7.58] and Quisenberry [7.09]), REW (4.76), and placed third in bWAR (5.9), behind Burns (7.0) and Gura (6.2). He also had the lowest H/9 in the league at 6.8 thanks in part to a tremendous defense behind him. Once again we have six left handed pitchers in my top ten: Burns, Gura, Burgmeier, May, McGregor, and John. John is a holdover from the 1979 list, but everyone else is new for 1980. You just don't see this much quality lefty pitching these days. Jon Matlack of the Rangers just missed as well. The role breakdown is 5 SP (Norris, Burns, Gura, McGregor, John), 4 RP (Corbett, Burgmeier, Quisenberry, Gossage), and one swing man (May), which is quite diverse compared with what you'll see currently. That again is down to fewer innings for relievers in modern times, as two of the relievers pitched 99 innings (Gossage, Burgmeier), while Corbett and Quisenberry were up around the 130 IP mark, and May pitched 175.1 IP. Some swing man. That's a season's worth for some starters these days. What a rubber arm. I have Stieb narrowly over Morris that year, as Stieb was able to outWAR him (according to both sites), and it was basically a saw off in WPA and REW. Stieb also had the better ERA+ at 117 to 99. 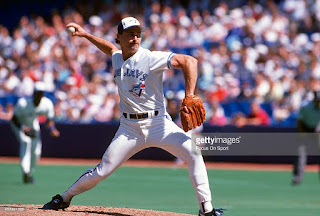 For what it's worth, Stieb made his first appearance at the mid-summer classic, while Morris would have to wait until the following year for his. So that's 1-1 if you're keeping score. Just as I was praising them to the skies for 1980, the tire fire of 1981 had to come along. One step forward, two steps back. Such is life when you're trying to develop talent at the big league level. The strike of 1981 was heartbreaking for baseball fans, but it probably couldn't have come at a better time for the Blue Jays. They stumbled and careened out of the gate to a miserable 16-42 record (.276 WPct!) when the strike hit. After re-convening, they managed to go 21-27 in the second half, but the damage was already kind of done. A 37-69 record in the overall, good for a .349 winning percentage, which projected out over 162 games, would've resulted in 105 losses. A much better job by the writers this time around, as Fingers was definitely in the conversation with a ridiculous RA/9 (Runs allowed per 9 IP) of 1.04 across 78.0 IP. I put the two starters ahead of him though as they were slightly better. McCatty/Blyleven is really close. If WAR and only WAR is your thing, then your choice is Blyleven as he bested McCatty in both versions. However, McCatty was better in ERA+ (148 to 127), WPA (3.59 to 1.91), and REW (3.56 to 2.25). McCatty also tied for the major league lead in Winzzz with Dennis Martinez, Pete Vuckovich, Tom Seaver, and Jack Morris (all at 14), and led the AL in ERA and shutouts. Like I said it's very close, but I went with McCatty. One thing is clear: Blyleven got absolutely no respect from the writers in this or any other year, and they almost flubbed his slam dunk HoF case, but that's definitely outside the scope of this rambling. This time there's a more normal ratio of 7 righties to 3 lefties (Righetti, Gura, Burns), and only one reliever in my top ten (Fingers). Guidry and McGregor were two lefties that just missed, along with righty starter Dennis Martinez, and Gossage was the only other reliever that was close enough to warrant a mention. Don't understand the writers' infatuation with Vuckovich. He had a decent season, but it was more like top 25ish than top 5ish, at least from my perspective. Must be the winzzz I guess. As for Morris v Stieb, the 1981 season is ridiculously tight. Stieb was better in the WAR department (both versions, very narrowly in fWAR [2.9 to 2.7] and a little more decisively in bWAR [4.5 to 3.4]), and WPA (2.18 to 1.51), they are virtually identical in ERA+ (124 to 123 for Morris), and Morris has a big edge in REW (2.21 to 0.55). Morris also shared the lead in wins with four other pitchers, but he did allow the most walks (78) in MLB. Stieb plunked the most hitters (11) in MLB though. We're splitting hairs here, but I give the narrow edge to Stieb in the end. It's almost too close to call, but IMHO Stieb comes out on top. So that's Stieb 2, Morris 1, with Stieb's amazing peak yet to come. That, my friends, is for another day.